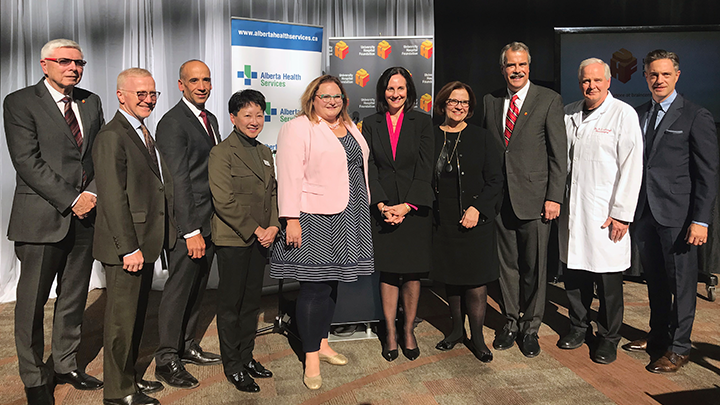 Minister Sarah Hoffman (pink jacket) and Dr. Verna Yiu (to her left) join members of Alberta Health Services and the University Hospital Foundation in announcing new funding support for a redeveloped neuro ICU at the University of Alberta Hospital. EDMONTON — A new partnership between the Government of Alberta and the University Hospital Foundation will advance brain care for Albertans. The Government of Alberta is investing $12 million to advance the development of a new neurosciences intensive care unit (neuro ICU) at the University of Alberta Hospital. The funding matches a further $12-million commitment from the University Hospital Foundation. The current ICU has 11 beds and is a referral centre for Edmonton and northern Alberta, northeastern British Columbia and the Northwest Territories. The future expansion will increase the ICU’s capacity to 24 beds in single-patient rooms. “Redeveloping the neuro ICU at the University of Alberta Hospital is a priority project that will increase capacity and improve family and patient experience,” says Dr. Verna Yiu, President and CEO, Alberta Health Services. Dr. Keith Aronyk, neurosurgeon at the University Hospital, shares his excitement for the recent announcement, made on Oct. 3. The redeveloped neuro ICU will provide advanced technology and create a healing environment for staff and physicians to provide neurology and neurosurgery care. Jim Brown, chair of the University Hospital Foundation and co-chair of the Brain Centre Campaign, adds that many generous donors made the foundation’s contribution possible. “Thanks to incredible community support, our vision to give patients at the University of Alberta Hospital access to the most advanced brain care in the country is becoming a reality,” says Brown. Since the 2011 launch of the Brain Centre Campaign, the foundation has raised more than $50 million to advance brain care in Alberta to world-class levels. These investments have included Canada’s first stroke ambulance, the Dan and Bunny Widney Intraoperative MRI Surgical Suite, the Scott and Brown Families Advanced Imaging and Gamma Knife Centre, a second Neurovascular Interventional Suite, the Doreen Lutsky Hooper Rehabilitation Clinic as well as millions more invested into brain-related research and international recruitment of physicians and researchers with brain-care expertise. In 2017, Wayne Gretzky donated $99,000 to the Brain Centre Campaign and was named its honorary chairman. If you would like more information on how to support the University Hospital Foundation’s Brain Centre Campaign, please visit braincentrecampaign.ca. Visit ahs.ca/give for a full list of Alberta’s health foundations.